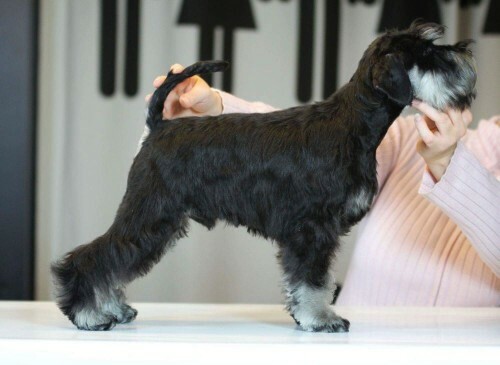 Fullcool Bobby McGee or Alan as we know him is one of the finest Black & Silver Mini Schnauzer in Ireland today. 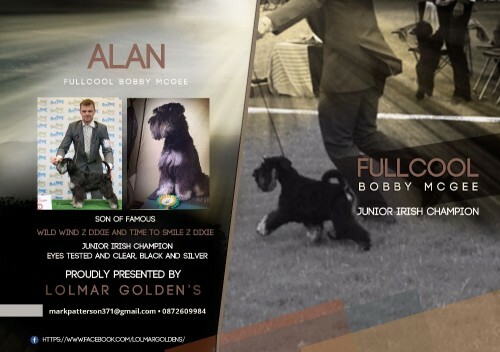 Alan recently was crowned Irish Junior Show Champion at the International Irish Kennel Club Show on St. Patricks Day in Dublin. Alan was imported from the famous Fullcool kennel in Croatia from Kaca Kacian in March 2017 and has prospered during his time here. Alan has already secured 2 Reserve Green Stars at the tender age of 7 months, multiple Best of Breeds and numerous Best Puppy at Championship Show outings. This dog is a true champion in the making. His father is the great Wild Wind Z Dixie from the world famous Z Dixie Kennel in Prague, his mother (Time to Smile Z Dixie) also from the Z Dixie Kennel. If you wish to cross your female with one of the finest examples of the breed in Ireland today, please contact us to make arrangements.